I learned to run my race the hard way. I don’t run with my husband. I coach runners, train athletes and I have much more running experience than him. I still don’t run with him. We tried it a few times. It always ended the same way: “You were half-stepping me the whole time.” “Well, you kept speeding up and slowing down.” Mad, mad, mad. And that is NO way to end a run. It was even worse when we used to run races together. Giving so much attitude pre-race in the POJ line. Who wouldn't want to run with me? Having the experience, I always start out a little slower than I intend to finish. He would pace off of me, hang back and use me as a rabbit. Then *BAM* he’d take off in the last half-mile and breeze by me, after I’d done all the pacing work for him. So rude. For me, it’s distracting knowing he’s there, wondering if he’s ok, waiting for him to blaze by me-again. Ugh. No fun. I learned to run my race from him. We hit the POJs together (well, he tags along so I’m not lonely in the God-awful lines) and line up in the same corrals. 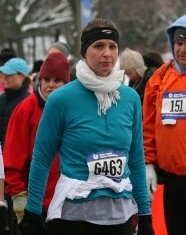 To be fair, I'm not very smiley at ANY start line--it has nothing to do with JB being there. …and then I run my race. I tune everything out, relax into my pace and my strategy and I run. I don’t care if he beats me or if I beat him, I just want to run my race. When I think about everyone else, it wastes energy and I have a crappy run. I learned from my mistakes. Stick to my pre-race routine, no matter what. Hang back when the gun goes off and let the crazies take off like bats outta hell. Don’t stress about people passing me. Have a pace plan to follow for every mile so I don’t get caught up with the cheering crowds. Race myself, not every single person on the road that day. It’s a mind thing. Stay relaxed. Don’t stress. If you get caught up with how your friends are doing, whether or not you can pass that girl in the pink shirt or if your husband is dying on the side of the course 10 feet behind you and will need to be picked up by an ambulance and you won’t find out until you’ve finished and PR’d and OH MY GOD that is my nightmare. Run your race. Everything else can wait. 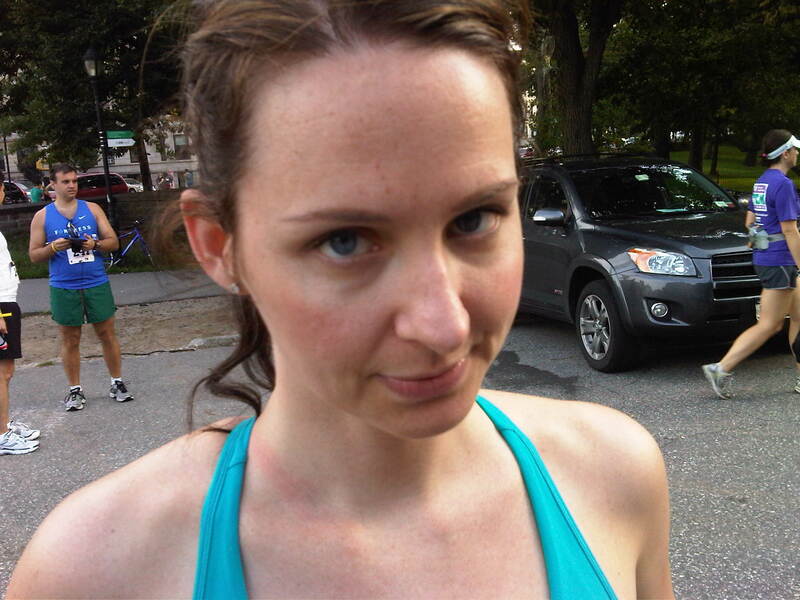 Running was always my thing and then my husband started and always just wanted to beat me. Now he’s finally admitted I’m faster and I go further. We start together and we’re together at the end so it’s not nearly volatile anymore. But it sucked for a long time. He could just pace with me and hang but nope. He won’t run next to me. Why?? I don’t know. Stubborn. So I kept going my pace and he goes his. No more tension but it shouldn’t have to be so hard…. Yeah, it just doesn’t always work out so nicely, right? I keep reminding myself that it is due to no failure on either of our parts that we don’t run well together. We certainly do other things very well together and those are the things that really matter! 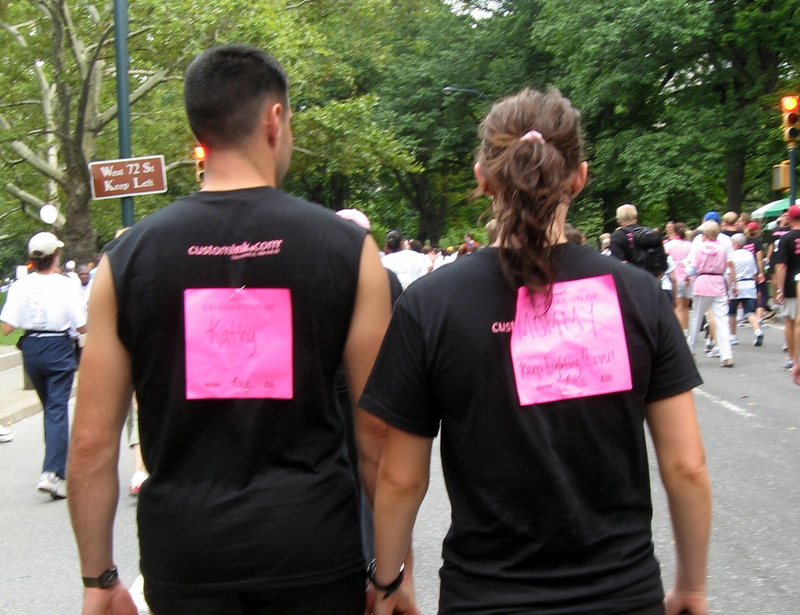 Seriously, Hubby and I don’t run together, either. I’m a happier runner if we split up before the starting gun so I don’t see him except at u-turns on the course. He’s more than a minute per mile faster than me. He has tried to “run with me” only to have his competitive side kick in and push the pace… And I have a competitive streak, too, so I wind up trying to keep up when I should be running my own race. …like a good husband should.